She calls herself Princess Etch A Sketch, and it's hard to imagine that anyone has more skill than Jane Labowitch at transforming this old-fashioned toy with two knobs into an artistic tool capable of recreating some of the most famous paintings in the world. 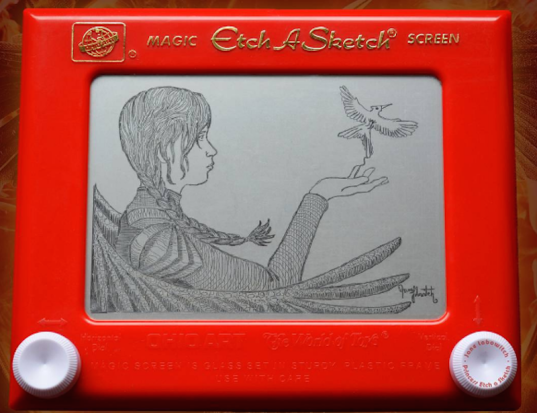 Labowitch picked up her first Etch A Sketch at the age of four and has been toying with it ever since. Now 24, the artist has turned her passion into an unlikely career. She sells originals and prints of her works on her Etsy site and even does commissions using family photographs. Labowitch spent more than eight hours working on one of her most recent and celebrated works, Georges Seurat’s A Sunday on La Grande Jatte. 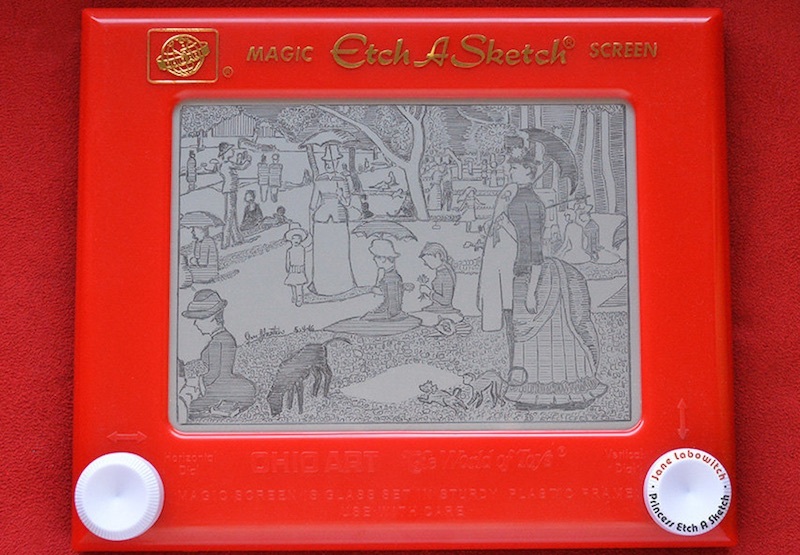 Over the course of four sittings, she visited the painting and Etch a Sketched while sitting on a bench nearby. Some of Labowitch’s other works include Van Gogh’s Starry Night, the Mona Lisa, and Van Gogh’s The Bedroom, which she sketched live on a television morning show. Additionally, Labowitch has also paid homage to pop culture with tableaux referencing Mugatu from the Zoolander movies, Elsa from Frozen, and Katniss Everdeen from The Hunger Games. We’re also pretty bowled over by her ability to transform a photograph into a vibrant, poignant, and unusual family keepsake. It should be noted that Labowitch has a bit of an artistic advantage over most of us: she has a BFA in Illustration from Chicago’s American Academy of Art. Labowitch has said that perspective is key in her creations and that she arguably spends as much time looking at and studying the masterpieces as she does actually creating them. We still have no idea how she managed to construct the incredible details, textures, and overall realistic results using the same two knobs that the rest of us have but struggle to make a house and a stick figure family — but perhaps 20 years of diligent practice (and innate artistic talent) can go a long way in transforming a simple screen into some spectacular visual representations. Labowitch spent more than eight hours working on one of her most recent and celebrated works, Georges Seurat's A Sunday on La Grande Jatte. Over the course of four sittings, she visited the painting and Etch a Sketched while sitting on a bench nearby. Some of Labowitch's other works include Van Gogh's Starry Night, the Mona Lisa, and Van Gogh's The Bedroom, which she sketched live on a television morning show. Additionally, Labowitch has also paid homage to pop culture with tableaux referencing Mugatu from the Zoolander movies, Elsa from Frozen, and Katniss Everdeen from The Hunger Games. We're also pretty bowled over by her ability to transform a photograph into a vibrant, poignant, and unusual family keepsake. It should be noted that Labowitch has a bit of an artistic advantage over most of us: she has a BFA in Illustration from Chicago's American Academy of Art. Labowitch has said that perspective is key in her creations and that she arguably spends as much time looking at and studying the masterpieces as she does actually creating them. We still have no idea how she managed to construct the incredible details, textures, and overall realistic results using the same two knobs that the rest of us have but struggle to make a house and a stick figure family -- but perhaps 20 years of diligent practice (and innate artistic talent) can go a long way in transforming a simple screen into some spectacular visual representations.